The 2011 Center for Animal Health & Welfare Holiday Cards are now available; Help homeless shelter animals. The 2011 Center for Animal Health and Welfare holiday cards are now available for purchase to help raise money for the Center. 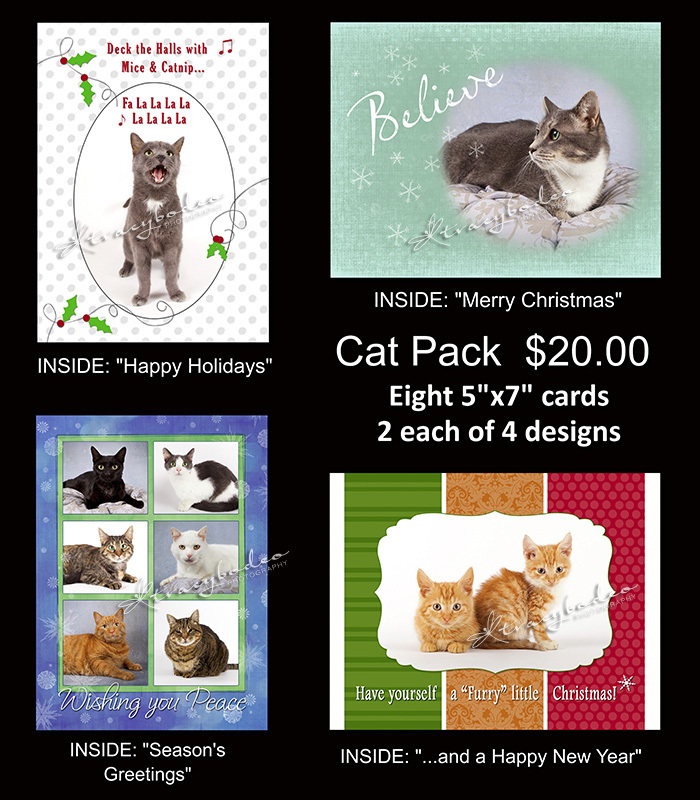 Each pack of eight 5×7 cards (2 each of 4 designs) costs $20.00 and all proceeds go directly to the animals at the Center. You can choose a cat pack or a dog pack or get one or more of both! If there is one particular style that you like best, you can also order one pack of 25 cards for $60.00. All of the animals featured on the cards are residents of the CAHW and some of them have been there for 1 or 2+ years. We are hoping not only to raise some money but also to raise awareness of our homeless pets and find them homes for the holidays. 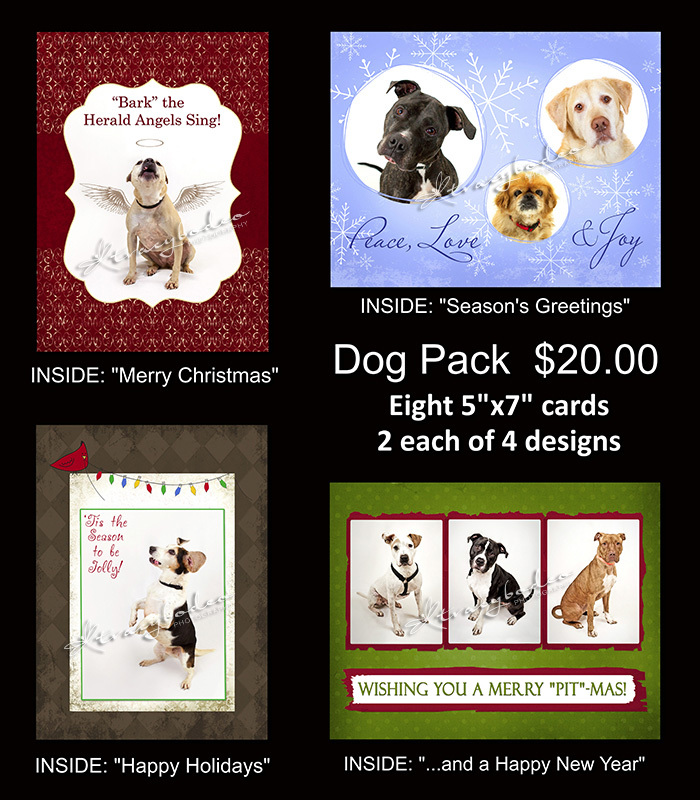 If you are interested in adopting one of our homeless pets or in purchasing a pack or two of our cards, please visit the Center in Easton www.healthyanimalcenter.com or contact me directly at mail@tracybodeo.com . Thank you to our sponsors who helped cover the cost of printing: “A Furry Tail Come True” Doggie Daycare and Boarding www.afurrytailcometrue.com (Hellertown, PA), AVH Veterinary Group www.avhvet.vetsuite.com (Pen Argyl, PA) and Bob & Joanie Thompson of Thompson Photo Arts- nature and wildlife photography http://thompsonphotoarts.com. Thank you for your support! Greenville, SC-based portrait photographer specializing in pets and their people, nature images and fine art photography. Posted on November 16, 2011, in Charity Events, Pet Adoptions and tagged dog portraits, fundraiser, holiday cards, home for the holidays, Lehigh Valley pet photography, The Center for Animal Health & Welfare, tracy bodeo photography. Bookmark the permalink. Leave a comment. FETCHING (ADJ.) = VERY ATTRACTIVE, CAPTURING INTEREST, WINNING, CHARMING + (VERB) = TO GO AFTER AND BRING BACK. FETCHING PET PORTRAITS by tracy bodeo photography…. Learn more about my work by reading the ABOUT pages and visiting my PET PORTFOLIO. For additional information about my portraiture, as well as my fine art photography, please visit my main website at www.tracybodeo.com . Thank you! Enter your email address to follow "Fetching Pets" and receive notifications of new posts by email. Save a Life; Adopt a Pet!